Sn.Shivarishi (NKT.M.Jeyagopal) had intense yogic experience and insights with the blessings of his Gurus. Having explored deeply varied aspects of yoga practices in several traditions under illumined masters, started to teach yoga since people naturally were drawn to him to learn yoga. Sn.Shivarishi started teaching Yoga in 1993, in a small way. From 1993 to 2003 after being a sincere teacher for a decade, Satyananda Yoga Centre was established by Sn.Shivarishi to generously hand over to every seeker a genuine and systematic approach to yoga and spiritual life. Satyananda Yoga Centre – Triplicane, was born on the auspicious evening of Diwali(2005), after the special havan at the sacred grounds of the Akhara of Ganga Darshan. Swami Niranjan named the centre and gave the eternal blessings of our Guru Parampara, which guides the Satyananda Yoga Centre in fulfilling its purpose. Since its inception, unswerving dedication to the tradition and to its commitment for providing an authentic and systematic dissemination of Yoga have been the beacons held high by the centre. Paramahamsa Swami Niranjanananda Saraswati, visited Chennai in February 2007 during his South India Tour “DISCOVERY OF HUMAN POTENTIAL”, which was organized by Satyananda Yoga Centers in Chennai. 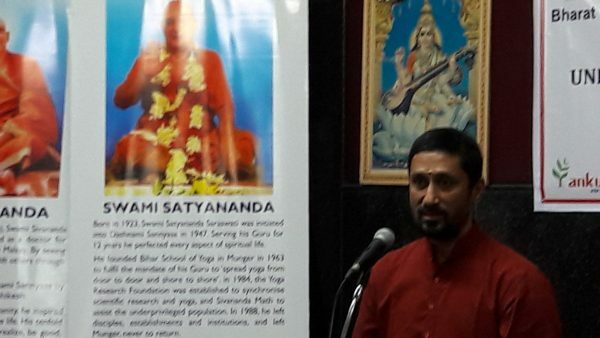 On 22nd February 2007, when Swami Niranjan Spoke about the work of Bihar School of Yoga, in Chennai, said “Satyananda Yoga Centre is an extension of Bihar Yoga Tradition or the Satyananda Yoga Tradition in Chennai”. Satyananda Yoga Centre has been established by Sn.Shivarishi (NKT.M.Jeyagopal) based on his understanding of Yoga, Sadhana and Spirituality through his sincere search since 1988!